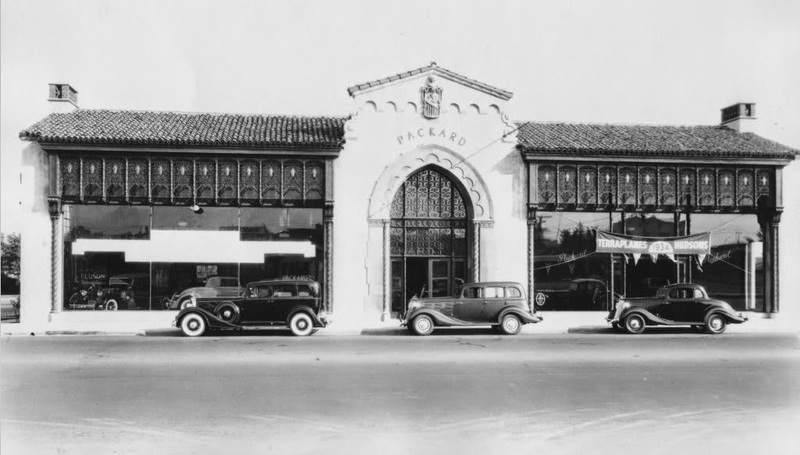 Taking influence from the old Packard showroom in Santa Monica (now a Mercedes Benz dealership), this facade is a further take on yesterday’s post, but obviously ditching the stair tower, and playing the apsoidal corners as solids rather than colonnades. Architectural language: it’s a fun thing sometimes. While taking its name from one of John Hejduk’s many unbuilt projects, the One-Half House, this project offers a different interpretation of an architecture of halves. One half-plan of Richardson meets one half-plan of Neutra. The entry portico is recessed into the building line, and takes cues from some vernacular Angeleno tract homes from the 1930’s (concurrent with Neutra’s earlier formal explorations). I do think that the stucco variation at the bottom is much more convincing than the overtly Richardsonian brick variant – but maybe it needs to be weaned of a little too much Krier (Miami, or Windsor). Further pulling the thread of hidden circular courtyards (here, here, & here), this exploration introduces yet another platonic geometry: the triangle. Low gables on each facade take the center, allowing colonnades to wrap the acute corners, while a circular colonnade sits in the middle, centered on a triangular obelisk in a circular pool. Interior spaces are fluid, with low walls and pipe columns hinting at spatial division. The dialogue between the round courtyard and the triangular roof ridges creates a dynamic interior roof form with exposed rafters throughout. This house plays a game of symmetry, where the magnificent double gable of Lutyens’ Homewood is played on every facade, but punches out by one module on the east and west facades. The stair is set off-center, with a tall square atrium (Craig Ellwood of two posts back), and an asymmetrical collage of symmetrical rooms inside. My first plan (above) had double columns throughout, the second plan (below) favors the single centered column. From last Friday’s foray into Craig Ellwood’s Scientific Data Systems building, I offer a revised take, with a large standing seam copper hip roof, and a skylit rotunda in place of the cubic atrium, and rounded out the panelled masonry walls along the east and west axes. Placing a large hip roof on a square form may be a subtle nod to Thomas Beeby’s Baker Institute at Rice University. The detail at right shows a new cornice with dentils and beads rendered in brick. Maybe something fun could be done with those columns. . .
Driving through El Segundo the other week, I ran across a nice Miesian office block. A quick internet search for the name ‘Xerox’ which was left stained on a concrete wall and I stumbled across an all too familiar name – Craig Ellwood (Originally built for Scientific Data Systems, which was later bought out by Xerox). A floor plan confirmed my suspicions – a perfect square on 64 columns, raised one floor off the ground with a directional access given by two long walls on the east and west facades, and storefront gazing on the north and south, all centered on a cubic central atrium. 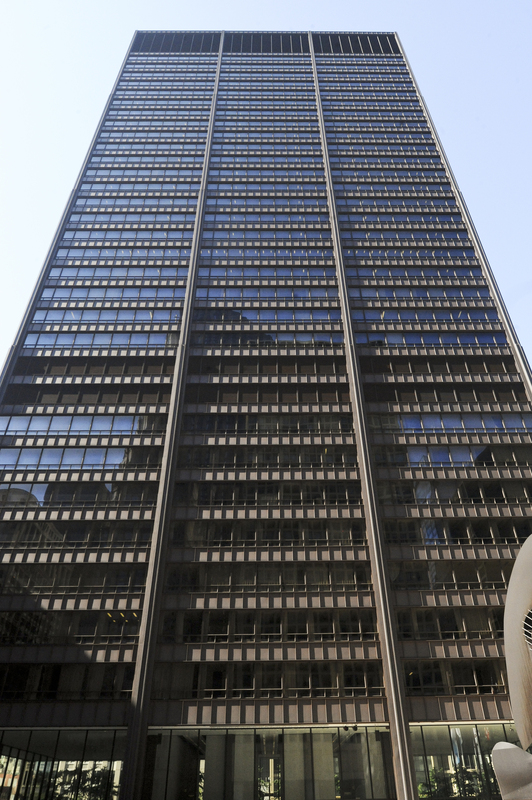 The details are almost perfect derivatives of Mies’, but the vertical window mullions stop at the spandrel panels rather than continue full height as MVDR would have done (see Murphy’s Daley Center compared with Mies’ IBM tower). The whole project is undergoing a less than inspiring renovation by SOM, with absolutely no heed for the building module and planted ‘green’ walls. Too bad. Because even the most mundane of elements deserve to be thoughtfully and appropriately considered, I’m featuring a series of details and design considerations for a gate at my house, fronting a small garden courtyard. Typical wood rails span brick piers, with a weighted chain closer to keep things tidy. Returning to the work of Lutyens, this small room takes its primary cue from a detail in a stair hall at Viceroy’s House, New Delhi, where an arcade is topped with a small pendentive at the corner, curving the profile of the ceiling. Wormseye axonometric views follow – the bottom image also has sectional and wormseye studies of another Lutyens-inspired previous post. Sometimes the drawings I post seem rather schematic, but as part of the great importance of building in architecture, they can never remain that way. Here I present you with a more detailed take of a recent post, with hybrid Tuscan-Doric columns (perhaps Graves doing Doric, maybe? ), minimal Mies-ian window jambs and stops, shingled wall with a moulded cap to make the column in antis, all topped with a simplified architrave, rosettes replacing triglyphs. I fancy the wood work might all be painted a glossy black, similar to Earnest Coxhead’s shingled houses in San Francisco (and Bob Stern’s take on them). Plan as generator (aka, ‘floor plan comes first, elevations second’), with a long hallway bisecting a semi-cubic volume, colonnades at either end. Now a staircase – centered on the hallway, one half of the house takes a large ballroom, while the other is bisected into two smaller drawing rooms. The second floor, two long, windowed rooms sit over the porches, while a tall pyramidal skylight tops the stair hall.